The director of Tribulation 99 and Sonic Outlaws returns with his grandest work to date! 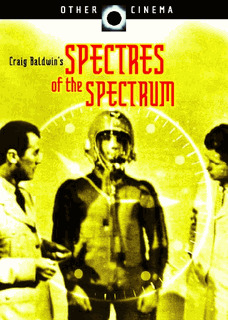 Spectres of the Spectrum plunders Baldwin's treasure trove of early television shows, industrial and educational films, Hollywood movies, advertisements and cartoons, combining these with live-action footage, no-budget special effects, and relentless narration to generate a wholly original paranoid science-fiction epic. BooBoo, a young telepath, and her father, Yogi, are revolutionaries pitted against the "New Electromagnetic Order." Their story, set in the year 2007 in a blighted Nevada outpost, is interwoven with a history of the development of electromagnetic technologies, from X-rays to atom bombs, from television to the Internet.